The publication of The Wealth of Nations in 1776 coincided with America's Declaration of Independence, and with this landmark treatise on political economy, Adam Smith paved the way for modern capitalism, arguing that a truly free market - fired by competition yet guided as if by an 'invisible hand' to ensure justice and equality - was the engine of a fair and productive society. 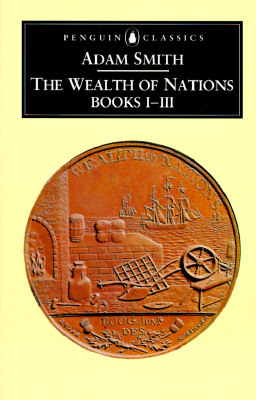 Books I - III of The Wealth of Nations examine the 'division of labour' as the key to economic growth, by ensuring the interdependence of individuals within society. They also cover the origins of money and the importance of wages, profit, rent and stocks, but the real sophistication of his analysis derives from the fact that it encompasses a combination of ethics, philosophy and history to create a vast panorama of society. This edition contains an analytical introduction offering an in-depth discussion of Smith as an economist and social scientist, as well as a preface, further reading and explanatory notes by Andrew Skinner. For more than seventy years, Penguin has been the leading publisher of classic literature in the English-speaking world. With more than 1,700 titles, Penguin Classics represents a global bookshelf of the best works throughout history and across genres and disciplines. Readers trust the series to provide authoritative texts and notes by distinguished scholars and contemporary authors, as well as up-to-date translations by award-winning translators. Adam Smith (1723-90) was born in Glasgow and educated at Glasgow and Oxford. Two years after his return to Scotland, Smith moved to Edinburgh, where he delivered lectures on Rhetoric. In 1751 Smith was appointed Professor of Logic at Glasgow, but was translated to chair of Moral Philosophy in 1752. His The Theory of Moral Sentiments was published in 1759 and The Wealth of Nations in 1776, the same year as the Declaration of Indpendence. Andrew Skinner teaches at the Adam Smith Institute and is an expert on the author's work. "Adam Smith's enormous authority resides, in the end, in the same property that we discover in Marx: not in any ideology, but in an effort to see to the bottom of things."